Filmed with one camera and lacking cuts, fades, and other editing gimmicks, the film has a raw quality — and at no time did it seem like the persons filmed broke the "fourth wall." And I can attest to the reality of it. Senkyo is a fairly close approximation of my own campaign experience: a city council by-election in a smallish city in Kanagawa Prefecture. The difference is, of course, that I was on the DPJ side and this film shows an LDP campaign. However, what one can see in this film is the extent to which the Japanese art of campaigning is ritualized. A number of details in Yamauchi's campaign were familiar to me, some less obvious than others. The sashes with candidates' names; the sound trucks; the white gloves on candidates; the grimy, tiny, dimly lit offices covered with endorsement posters from senior party officials and posters of the candidate; the brightly colored windbreakers worn by campaign staffers; the banners lugged from place to place; the endless amounts of bira (fliers); the utterly meaningless slogans; the very active involvement of sitting officials in getting their party's man elected; the intervention of national politicians in a tiny, largely insignificant campaign — and the otherworldly quality of Japanese campaigning, a kind of ball of noise and frenetic activity that descends upon some place and vanishes a short while later, restoring calm. What one also sees in this film is the gossip and the pettiness and the heavy-handedness of the LDP machine — and Yamauchi's utter unsuitability for campaigning — but that is not what I want to discuss here. Rather, Soda's film rises an important question: what is the value of elections if they do not act a transmission belt for the priorities and concerns of voters? There is, of course, a ritual and repetition to campaigning in any democracy — although Japan probably has more than most, and there is less use of media, admirably so, than in other mature democracies. But ideas and policies are almost incidental in this film, and so in all Japanese election campaigns. Yamauchi's policy commitment is basically "I support Prime Minister Koizumi [this was in October 2005] and reform," which cannot make all that much difference in how Kawasaki is governed. While recent election law changes (finally!) permit candidates to produce detailed election manifestos, Japanese electioneering is still rooted in the mindless repetition of the candidate's name, the party affiliation, and a short slogan. 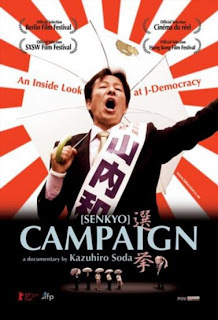 In fact, what is striking about this film is that for a film called Senkyo, there is remarkably little interaction with voters, who are for the most part indifferent (or altogether absent). The only expression of interest in politics from citizens can be seen when Koizumi came to Kawasaki to campaign for LDP candidates, prompting crowds to greet him like a rock star. But is that democratic participation, or is it demagoguery, as some Koizumi skeptics and critics claimed? I fear that for many Japanese citizens, politics is something for other people, not them. It does not concern them. Governments come, governments go, and life goes on. And meanwhile, actual decisions that affect citizens' lives are made far away from the eyes of the public, making government seem that much more like a natural phenomenon — like the weather — that comes and goes, sometimes for ill, sometimes for the better. So elections serve neither as a vehicle for holding officials accountable nor as a transmission belt for public concerns. Neither politicians nor voters seem to take their responsibilities seriously, meaning that election campaigns, for all the ritual, are remarkably hollow, full of sound and fury but signifying nothing. "I fear that for many Japanese citizens, politics is something for other people, not them." Don't worry, things are set to get far worse, ahem, I mean far better now that Minshu-kun is here!